These churros are adapted from Tessa Kiros's fourth book, Piri Piri Starfish. As from the title, one could deduce that this whole book is about Portuguese cooking and I know, the first question everyone pops to me, aren't these Spanish? According to Tessa, these are available in the north of Portugal at the funfair...everyone on the streets eating sugar-dusted churros from paper packets. These are perhaps more Spanish than Portuguese, but you know how it is with your neigbours...you peep over the fence, are inspired by their flowers, and have all the same ingredients and climate so everything grows the same. Countries are just the same, peeping over borders and being inspired by what you'll find. You'll need a piping bag with a large star-shaped nozzle to give this their lovely crispy ridges. I didn't have any and ended up using my largest one which unfortunately, is still very small in diameter. I have also experimented both ways. I've read some churros that requires piping on a baking sheet and freezing it for 20mins before it is fried to perfection. Others require the churros to be piped straight into the hot oil. I tried both and I can tell you if you pipe it straight into the hot oil, the shape holds and is more prominent. But however, you couldn't get cute little hearts like that if you pipe it directly into the oil can you? Well, maybe you can if you're an expert but I'm no expert and I in fact very much hate deep-frying at home. Shallow fry is enough to cause havoc let alone deep-fry but the stingy side in me refuse to pay even a dollar for nothing more than just dough. Eggs, butter, flour and sugar....that's practically what you need to make these. That's my man standing at the back willingly posing for me. We did this together last week because he couldn't bear the thoughts of having oil splattered over me. I made the dough and he deep-fried it to perfection. We kept eating as we go along and it was gone in no time. This one will make about 10 if you use a 1cm star-shaped nozzle though I'd say they'll look best when they're piped put from larger nozzles. For the dusting, I've used one part of cinnamon powder to 3 parts of icing sugar and I think they are the best at this ratio. Feel free to try your own ratio. Put the water and the butter in a small heavy-based pan and heat until the butter has melted, then bring just to a boil. Meanwhile, mix together the flour, sugar, baking powder and salt. Whisk the eggs. When the water comes to the boil, remove it from the heat, pour in the flour mixture and stir vigorously with a wooden spoon until you have a soft pastry with no lumps. Return to the heat for a minute or two until the mixture forms a smooth ball. Tip the dough into a bowl and leave to cool a bit. Using electric beaters, beat in the egg bit by bit until it is completely incorporated and the dough is smooth and glossy. Put into your pastry bag with a 1 cm star nozzle. Heat enough oil to cover the base of your frying pan. Squeeze 10-12 cm lengths of dough directly into the hot oil, nipping off the ends clearly with scissors or a sharp knife. Fry on both sides, turning when crisp and golden, and lift out onto kitchen paper to absorb the oil. Serve, sprinkled very generously with icing sugar and cinnamon. 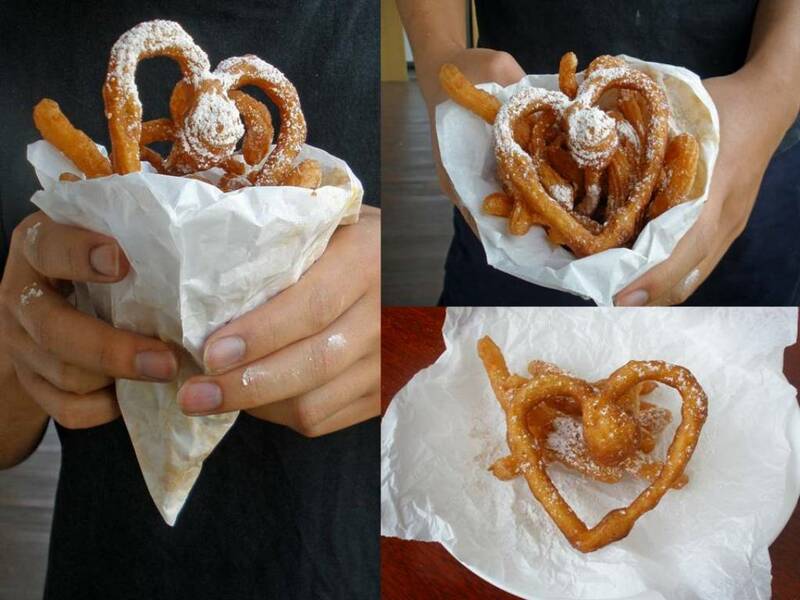 We heart these churros and hope you will too! I LOve ur curly wurly churros! so cute...esp teh heart shaped ones! u clever girl. I never thought of that! Oh your churros are so cute. Love the heart shaped one. I come from Argentina where churros are eaten in summer at the beach for a relaxed version of a 5 o'clock tea... easier to eat churros than cake! I guess the spanish immigrants passed them on. You can get them like this, simple and good. You can also take one step further and fill them with cheese... or jam, or dulce de leche (I don't know if you've heard of it where you are at... it's an Argentinian jam made of milk...like a caramel..only not caramel! ). Anyway, they are heavy and...greasy.. and not for every day consumption, but they make fun food with friends. wow I just had churos, just love them! thanks for sharing it! I had my first churros in Barcelona with super thick hot chocolate, so good! These look amazing. What great pictures. Thanks everyone! I know, the heart shape churros is simply too cute to eat! Shirley: Other people's churros look so much better but I have to agree, mine just somehow turned out looking like You Tiao. Florcita, yes I have tried churros with filling. They have a machine to do it, it fills and pipes it out into hot oil at the same time. I'm not sure if that's possible to be done athome but nonetheless, I'd just make some chocolate and DDL (yes, I've heard of them and made some myself to drizzle over ice creams!) and use it as dipping rather than filling. But I just love how simple and plain tasting these are sometimes just with sugar powder and cinnamon! I love churros but to make them at home is a no-no, too much oil and cleaning up. Love the heart-shaped churro.